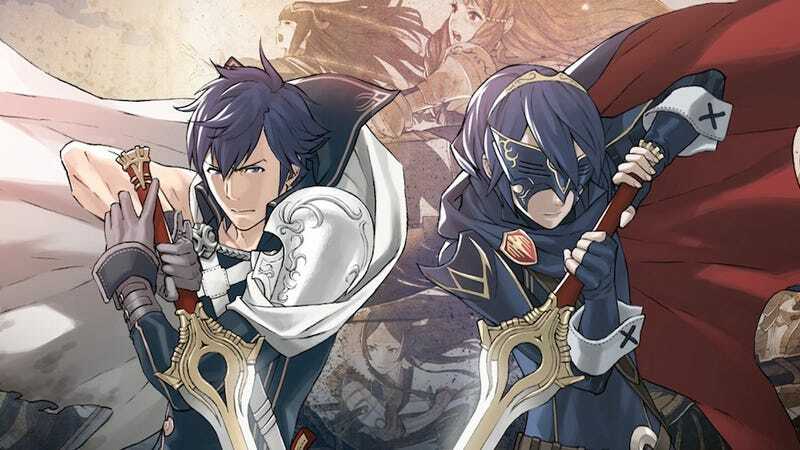 We've talked plenty about how much we like the new 3DS strategy role-playing game Fire Emblem: Awakening here at Kotaku. Among other things, we like the romance, the permanent death and the even more permanent marriage. And all this despite the fact that no one in the game has feet. But while I've talked a little about how much I like Hiroki Morishita and Rei Kendoh's music, today I wanted to focus on something a bit more specific: what I can only call the game's "aural milieu." It's a combination of the music, the sound effects, the shouted dialogue, and the menu noises… it's really something else, and it's a big part of what makes the game so memorable for me. It's a seamless bit of musical sleight-of-hand, and keeps battles moving forward with a wonderful sense of musical momentum. On top of that, the sound effects themselves are top-notch, video-gamey skriings and cachunks that mix perfectly with the dramatic attack animations. And the voice-acting kills me—every time Frederick prepares for a critical strike by telling the enemy, "Pick a god and pray!" I do a fist-pump. It's difficult to convey the way the whole thing works when you're playing, particularly since capturing video from a 3DS is such a dicy proposition. I thought I'd just share some audio I recorded from the game, since the game's soundtrack alone doesn't really convey the way it changes on the fly in the game. Here's some music from a recent battle, with the sound effects turned off. The first switch from wide-view to closeup happens at 0:40. Now, listen to another battle I recorded with all of the audio, and just take in the sound effects, taunts and music, and listen to how it all fits together. You can also hear the occasional "hooray!" music that plays when you pick up a new item. We get so used to seeing and hearing video games at the same time that it can be a bit discombobulating (and cool) to listen to a game without viewing it. The rhythm of a battle in Fire Emblem: Awakening isn't quite like any other tactical role-playing game I've played. It manages to take a genre of game that isn't always inherently seat-of-your-pants exciting and add drama, tension, and a hugely pleasing sense of flow. Fire Emblem: Awakening is a great game for a number of reasons, but its sonic identity is one of the most distinctive.